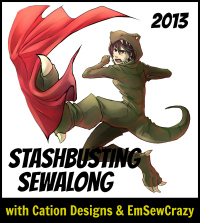 First the stashbusting sew-a-long then the Map the Sewintists the next stage is participating in a blog swap! Rachel at House of Pinheiro is hosting an International Craft Swap! Rachel has paired me up with a person and I am going to make them a little something based on the information about that person I’ve been sent. I just *hope* they will like what I make! The theme is: nautical. I got the information about my partner this week and I have until the 5th of April to get my item made and sent. The rules state I should also include a little gift, maximum £3, or equivalent value. We are being encouraged to use stash fabrics if we can too. Interests/hobbies – sewing, acting (amateur dramatics), travelling to warm places, organising things (! ), cycling, films and being utter rubbish at knitting! Likes and dislikes – I adore sweets/candy! As for dislikes, I am very accepting and would feel delighted with anything made with me in mind. Just to harp on with my ‘aren’t we lucky to all be part of this amazing community of sewists’ business – how nice is Rachel to organise this? People are so kind. So another giant step in to the Sewing World – I am so excited! Have you ever participated in a blog swap? Any ideas for what I could make on the nautical theme? What would you hope to receive on such a swap? Leave a comment; I’d love to hear from you!